This tiny little board, measuring just 35mm x 18mm is probably one of the easiest STFM upgrades ever. This booster is designed 100% by myself and gives clock free glitching unlike the older 16MHz mods. This booster works by clocking the CPU at 16MHz when the CPU is not accessing the ST bus and is doing internal instructions. Some people in the past have frowned upon this type of mod as overall it only gives 27% speed boost. Though on some math functions like integer division we can see we are running at 195% speeds. Blitting gets a nice 41% speed boost, so we shouldn't look down on these simple speed boosters as they really do give a nice boost in speed. As the original ST 68000 CPU can only operate at 8MHz, the kit comes fitted to a newer 16MHz 68000 CPU. So first we must remove the old CPU as it will not be able to operate at higher speeds. Note - If you plan to add a 8/16mhz switch then please read the steps to do this further down this page before fitting. There is a small black wire which replaces pin 15 on the CPU. This wire must be soldered first into where pin 15 of the CPU would normally go. I forgot to take a image of the wire on its own, but this image basically shows where the black wire goes. Please ignore the top black wire as it is not needed when the PCB is soldered on top of the CPU. With the current PCB the CPU pin lifts upwards into the PCB so that top wire isn't needed unless you are relocating the PCB for some strange reason. The last connection is a wire from the booster PCB to the Shifter pin 39. As there is a resistor going to pin 39, I soldered my wire to that rather than the shifter pin. I routed the black wire under a gap under the metal screening box so the wire does not get trapped when the metal lid is placed down. Note - On REV A design, I fitted a 100R resistor in the 16mhz line. If you have the first V1 design, then I recommend fitting the 100R resistor. It can be fitted either on the PCB end, or the shifter end of the black wire. This mod is available in my webstore HERE. Enjoy! Will this fit STF machines ? - Yes, it will fit any ST/F/FM machines. Will this fit STE ? - No. This kit is designed for DIP CPU and STE has PLCC. Will this fit any other machines ? The kit will fit on any Atari with DIP type CPU and should work. Though please bare in mind, I do not have any other machines to try this kit so I cannot say 100% unless someone tries it on some other machines. As such I cannot offer support for any machines other than STF/M. Will it speed up the blitter ? The blitter functions may gain a very small boost in speed, though this kit alone does not speed up the blitter itself. Please note if using the blitter, the results will differ from the results I stated on this page. Also the V1 booster is not recommend for use with a blitter. Though it is possible if the blitter clock is cut and connected to the CPU clock. A video on youtube HERE describes such a modification. Though there is a 8mhz track which can be cut near the blitter which might be easier. Will it work with xxxx hardware also - This kit should only effect the CPU not anything else in the machine, but obviously I do not have every bit of hardware ever created so I cannot verify this. Does it have cache ? This is a ultra simple board (low cost) and does not have cache. Will you be doing a STE version of this kit ? As the STE has PLCC CPU it makes a simple upgrade a lot harder as you cannot simply bend up pins on the PLCC CPU as it is in a socket. This would require track cutting to the CPU, where even if I produced a guide to do this, with so many motherboard revisions (which I do not have) it would still be limited as to who could install it with instructions I provided. The current PCB does not plug in over the PLCC socket either so it would require a totally different PCB layout, which of course costs to develop and produce. Due to costs and foreseeable difficulties in installing on a PLCC CPU (STE etc) I feel time would be better spent on other projects. Will the kit work with/without the CPU being in a socket ? It does not matter if there is a CPU socket or not. Its just makes life easier in installing the upgrade if you CPU has a socket. The black wires I supply with the kit was assumed to be fitted without CPU sockets. If you have a socket, then I would recommend changing the CPU wire with a larger with to fit tighter into the socket. I can verify for the STFM a socketed CPU plus this mod will just fit under the metal shield. Can I switch back to 8mhz for full compatibility ? Yes. Please read the guide later on this page on how to do this. Do I need any TOS patches or software for it to work ? No, once you fitted it, the board is fully automatic. Do you sell the PCB only ? Once my stock of CPUs is exhausted I will be selling the PCB only (assembled without CPU). Instructions on how to fit the board to the CPU will be published on this page at a later date. I have been asked a few times if I will make these again, so I made up another small batch with a slightly revised design. The new board is functionally the same as the old one. Also, I am adding in a 100R resistor between the CPU clock pin and the booster clock out. Also I am recommending (and will supply) a 100R resistor to go in series with the 16mhz line. This should hopefully solve issues relating to the MEGA machines. I did start using ACT chips but they did not work well for the CPU drive itself. So that IC has been removed for the F series again. Fitting remains the same as the previous design. I hope in the future to compact this design down into a single GAL instead of using logic chips. While the current V1 was designed with fast ROM in mind, it never happened. The option to move over to the GAL will allow people who also purchase the ROM kit from my store, the option to run the ROM at double speed. This may or may not happen as I am working on the V2 booster at the moment. The V1 can be adapted to switch the speed between 8/16mhz with some work as listed below. However note the V1 was not designed to be switchable so some extra work is involved. I strongly recommend if you want to switch speeds to buy the V1.5 booster instead. This switch is confusing a few people as there are a few ways it can be done, and depends on what machine its being fitted to (IE with or without blitter, & PCB revision etc). So In light of the confusion, I am recommending all boosters where a switch is fitted to be done as outlined below. 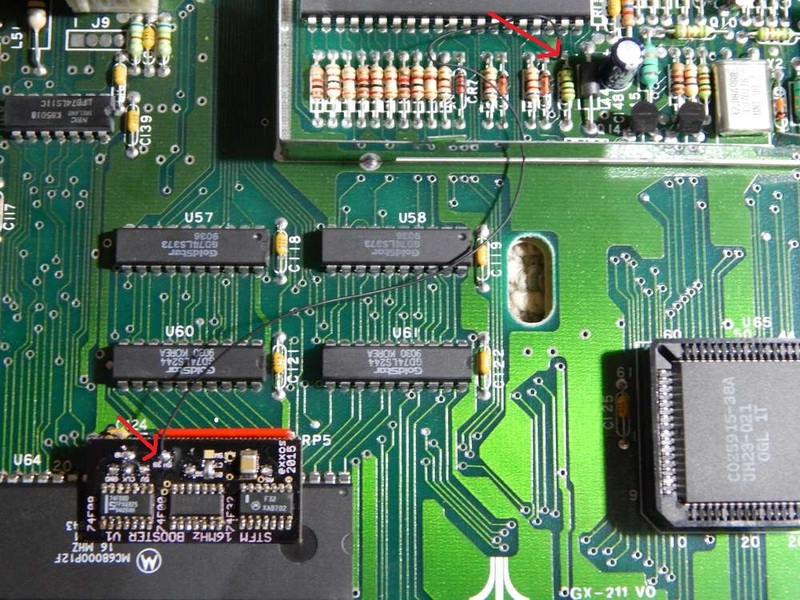 The solder pad on the PCB should be left in the 16mhz location, as shown in the red circle. Unfortunatly I don't have images of the switch itself fitted but its straight forward enough. Unsolder the header pin from between the CPU and the booster PCB. I would suggest using solder braid to remove the solder from the CPU pin. Also unsolder the pin from the PCB side. Then gently pull the pin out. The one side of a 3 pin toggle switch solders to CPU pin 6 (where you just unsoldered the header pin from, also where red arrow is pointing to). The center toggle switch pin connects to the booster PCB (on top where you unsoldered the header pin from). The last connection on the toggle switch needs to be connected to 0V somewhere. Normally there is a spare pad on the motherboard next to the PSU connector to pickup 0V from. This way, it bypasses /AS form the CPU which is the signal used to switch between 8/16mhz modes. So when the switch is connected to the CPU pin, it enables the 16mhz boost. When the switch is connected to 0V, it sets the PCB /AS pin to 0v, and forces 8mhz mode. Please note, you cannot switch between modes while the computer is turned on. You can only select modes before you turn on the computer.